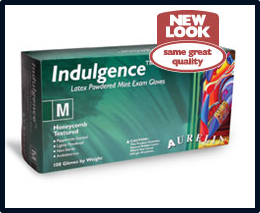 Aurelia Indulgence Latex Powdered Honeycomb textured Green Peppermint Latex Examination Gloves are made from 100% natural rubber, ambidextrous, powdered with “KEOFLO” Corn Starch (USP) and non-sterile. Our patented Honeycomb texture and Peppermint fragrance are Aurelia exclusives. Each batch of gloves is air-tested to detect pinholes. Aurelia gloves conform and are tested to the highest international standards.Refreshing peppermint scent for you and your patient. Patented Honeycomb texture for extraordinary gripping and tactile feel. Powdered lightly for easy donning.